We have now completed Week 7 since Harry’s Switch On date. So we are clocking up close to 2 months of hearing and a baby getting very close to 11months old. The cartoon I’ve referenced is the Bionic Six so allow me the pleasure of some Blog- poetic license in my inspiration today. 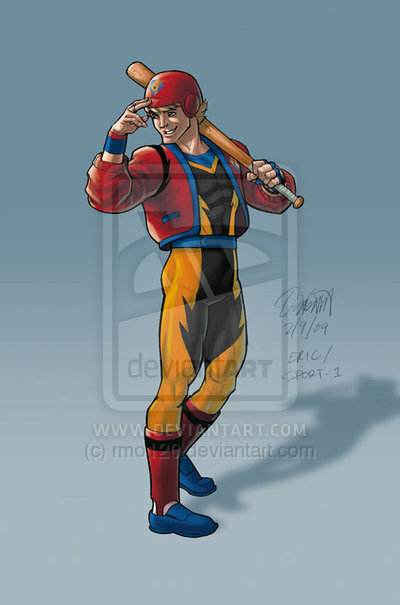 In the family of Bionic characters the son Jack has the ability to repel metallic objects through his electromagnetic powers. As you can gauge the magnets are still very much a constant source of time investment for me. Repelling the magnets has become a favourite game of Harry’s – just pulling them off or rubbing his head against something to knock them off, appears to be more fun than any game I can particpate in with him. I have started to think it is just the positioning of the internal magnets on Harry’s skull that is the cause. (Possibly due to the shape of his head). Looking at photos of other people and kids with the CI’s on, the magnet sits almost exactly above the ear. Harry’s left one is almost at the back of his head. I have decided I can learn to live with it as it is not going to change in my lifetime and I am sure he will love its position when he is older as it is less prominent from the front. Living with the magnets was even more palatable with last weeks agreement from the CIC to give me a number 2 magnet . Yippee…. Thank you and finally. I hope that this will be my last posting discussing the trials and tribulations of magnets and we can concentrate on Harry’s many other superpowers. The incredibly creative and visual mind of our friend Jane has given us a new version of the HearingHenry headband. I say visual as she created the headgear without Harry around just from pictures I posted on the Blog and her memory of seeing him – I AM IN AWE . Jane’s version has pockets to hold the processor in each side with popper studs to open and close them for easy access that is so much more economical than the braces elastics which we were working our way through faster than a teenager can eat hot chips. The pockets have been designed so the flashing light on the processor is fully visible ( this is our indicator for whether the magnets have fallen off as I ‘ve ditched the remote to save my nervous system) and Jane has also thought about an open area for the microphone so sounds are not muffled in any way. Combining this band with the new no.2 magnets we are so close to finding the solution to keeping Harry consistently with sound. If Harry is busy and happy with the sounds he is hearing we are onto a winner. It is funny; this last week I have noticed him pulling the device off for attention. How convenient for him- remove the Ears and mum comes running. If I am not around the girls have taken to screaming “Cochlear alert, cochlear alert”. This has no impact on Harry’s behaviour of course as he has already removed the Ears and is in his own pleasurably silent world. This week Harry had an appointment with the Physio. This is the 3rd session he has attended and he was referred by our paediatrician 6 months ago when she noticed his upper body muscle tone was slightly under-developed for his age. I haven’t really mentioned his physical development much in the Blog, as our primary focus is his hearing. But it has been an underlying concern for us that there definitely seems to be a link with Harry’s lack of sound and his gross motor skill development. Gross motor skills are the sitting up, crawling, walking milestones that every baby has to go through to develop “normally”. As part of our process to dot all the “i’s” and cross all the “t’s” we took Harry to see a Developmental Paediatrician in the beginning to assure us he was going to hit all his major developmental stages. So far all tests and diagnosis have been extremely positive and indicate that the deafness is isolated and with that we remain positive that it will always be such. The Paediatrician referred us to a Physio however, having picked up at 6 months that he could use some assistance with building his torso muscle tone. It was a simple case of the fact that he was not twisting the top half of his body to find sounds, so he was not building the necessary muscles in this area to allow him to sit up. Ultimately it was leading him to be reliant on lying flat on his back to play. So back to the Physio. I was excited to see her again as the last time we visited was prior to Harry’s operation. I really felt that his physical progress had been enormous since this time and she would be thrilled. One major milestone was his sitting up which took place 2 days after Switch On. 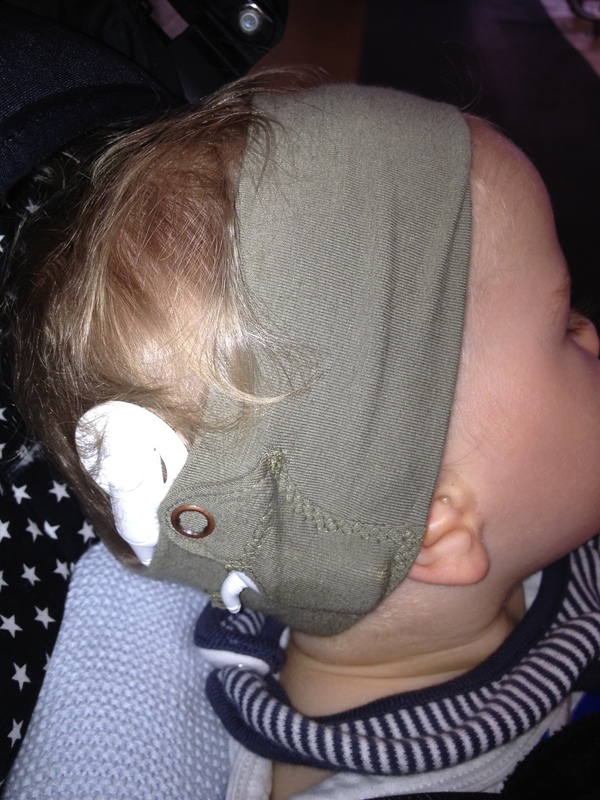 There is no scientific evidence that the brain receiving sound and vestibular system have a connection but in our book it was amazing to see Harry finally sit up on his own so soon after he had the CI’s switched on. We walked away today with 4 main strategies to work on over a month. The goal now is to get him crawling on all 4’s (rather than Slug- like as he is now) and to teach him to get from crawling to sitting and vice versa. This will then lead nicely into him pulling himself up to standing and then progressing to walking. The physiotherapist was very clear to point out that he would end up doing all of these things eventually but perhaps not in the most succinct fashion. As I had laboured the fact that I need him upright to allow for a better grip on the magnets, she agreed we would fast track this stage of development so we could get him less reliant on lying on the floor. I will be spending a great deal of time on the floor with Harry over the next 4 weeks pinning back his hips to force him to thrust his arms forward and push on them. This will lead to him realising that crawling can be more efficient by being on all fours and no longer dragging his tummy along with him. Based on the amount he eats I would have thought it will be immeasurably easier! The Physiotherapist also left me with some thoughts on Play. Play patterns are all linked to brain development and specifically I need to focus on teaching Harry about cause and effect. All those toys you see broken and scummy in the waiting rooms of doctor’s surgeries and crèches now needed to be on my shopping list. Posting a ball through a ball run to see it move from the top to the bottom. Banging on the pop up toys to see them appear from their hiding spot are all foreign games to me and I realised that at this age with both my girls I was already back at work and their development was in the hands of the childcare workers. 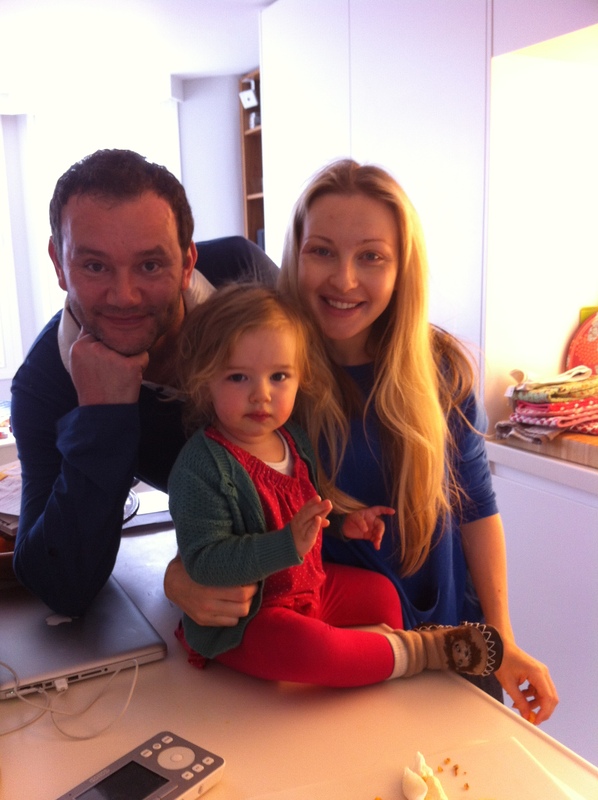 This is Oliver and Becky Dennis with their daughter Hope. Hope is 18months old and was also born profoundly deaf. The Dennis family are English and live in North London, an area that was very much a part of our lives before we moved to Melbourne 8 years ago. Last week the UK Sunday Times supplement ran an article on the Dennis family and their experience of discovering at her birth that their only child was profoundly deaf in both ears. 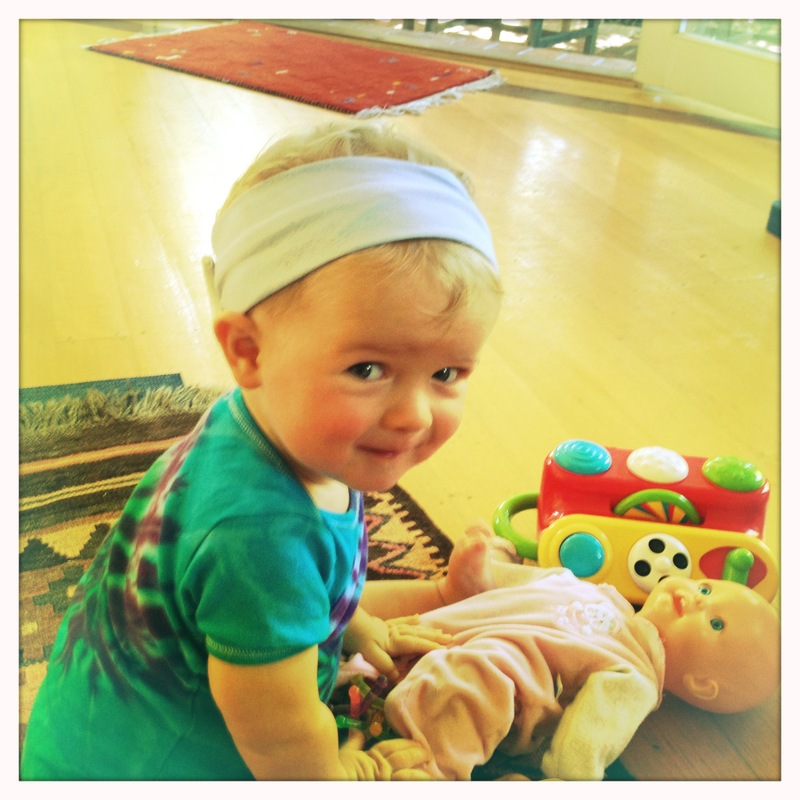 The article describes their journey to get her bilateral cochlear implants. Uncannily over the last 10 months we have often discussed what would have happened if Harry, like Tess, had been born in London. With the pioneering scientists and surgeons for Cochlear Implant technology based in Melbourne would we have indeed ended up living here eventually? For the Dennis Family the London Great Ormond Street Children’s Hospital provided them with an unfaultable service which was fully funded by the NHS (the same as we have here with Medicare). The story of funding is not so fortunate for those living in New Zealand however, where the Govt only funds one cochlear implant on the basis that you can hear with only one ear. I can’t even imagine how it must feel as a family to go through the trauma of finding out your child is deaf only to have to then start fighting to get funding to bring them into the hearing world. For sure this is the Lucky Country…………………. There are no more mapping sessions for 3 weeks now but we are still trouping into the Cochlear Implant Clinic weekly for observation appointments with Denise who is our speech therapist and case worker. During last week’s appointment we spoke about setting weekly goals for Harry so I had some concrete milestones directly relating to his listening skills. We are going to focus on “learning to listen sounds” which are the ones we naturally associate with a toy or an object. 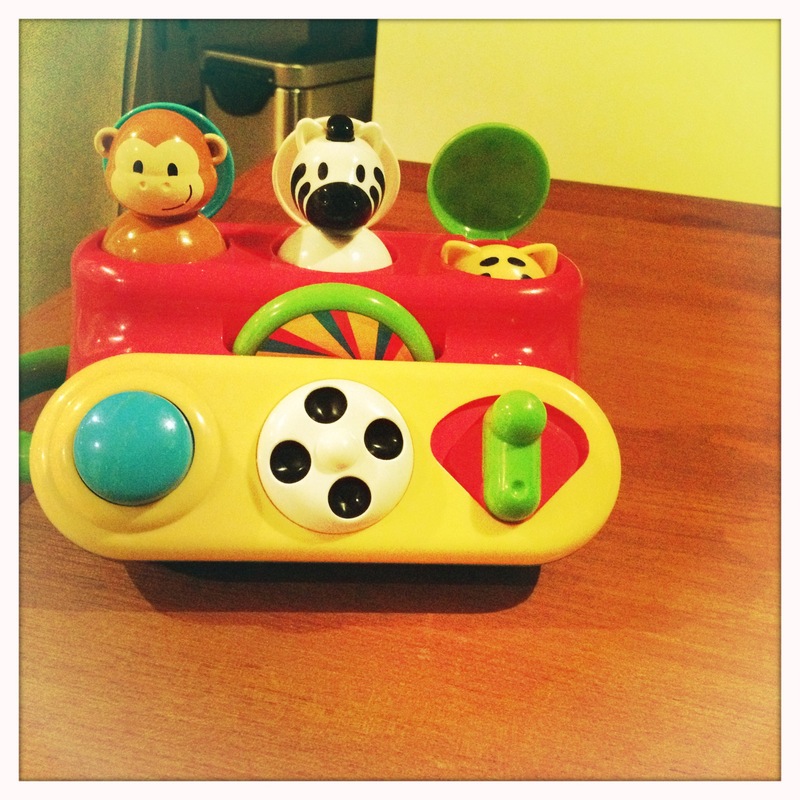 They are repetitive sounds and ones that are interesting for a baby to listen to. Sounds such as brrm, brmm for car, ee or for police car, and the obvious animal sounds such as quack , quack for duck and woof, woof for dog. It is important to not overwhelm your child with too many sounds so I was asked to pick 2-3 sounds that were from the same environment or group but had different pitches. I was also instructed to find varying examples of these animals to show him around the house. Naturally the girls suggested this was the perfect time to get the dog that we have said they can’t have, or perhaps a rabbit like their friends. All in a good cause of teaching Harry to hear his immediate environment. Poor ol’ Harry will have to stick to regular books and puzzles like other babies. It is really noticeable now that Harry is turning to sound. Most sounds of a substantial volume get his attention. He has already learnt that my voice is not that interesting, so I can’t say he is answering when I call him ( or that he is any different to Tess and Alice or even Dan)… but that will come with time. A hearing baby would start to respond to their name around about now at 10 months. But that is after 10 months of hearing it repeated a thousand times a day. Harry is only 5 weeks in. On Friday last week the HearingHenry headband arrived in the post. I mentioned this in my last blog as a Sydney mum of a profoundly deaf boy started a company selling these Online after needing to find a solution for her own young son. Her son Henry received his bilateral implants at 11 months so very similar to Harry. How I hoped they would be the solution to keep the equipment on his head. They are good. Probably more comfortable for Harry than the Joyband, which is quite tight on his head all day. This is a softer fabric with more stretch. And the processors sit on the outside secured by what looks like the elastics you used to have on your braces. I am questioning their strength and whether chewing through steak and chips all day is comparable to Harry wrenching at them whenever I am not watching. I have been through 3 since Friday…. It is not the ultimate solution but on Sunday he spent over 4 hours happily rolling and crawling around our backroom chasing a balloon in peals of laughter. With the addition of some double sided sticky tape to assist the inside of the magnet to stay on his head, the CI’s stayed on the entire time. Yes I did pull off most of his fluffy baby hair when I removed the magnets at 6pm that night, but he had a long time of hearing himself laugh and us along with him. Chasing Balloons 10.5 months from Hollie Feller on Vimeo. It has been three weeks since Harry was Switched On and we have now had two mapping sessions at the CIC. Our last session was on Thursday and it was pretty low key. This is really positive though as the levels they are increasing Harry’s sound to have not changed dramatically since the last session which indicates they are very close to getting an accurate reading of the right levels for his age. Based on my observations of his reactions and behaviour, the audiologists and speech therapists are thrilled with his progress. He is turning to sound and in some instances voices. He is verbalising the entire time he is wearing the implants and his sounds have varied pitch and tone. This all adds up to a strong recognition of sound and gives him a strong start in catching up with his peers in speech. For me the week has been unbelievably frustrating. It has tested my patience incredibly and I can only put it down to the magnets. I have tried so many different permutations of inserting the unit into the Joyband to ensure that the coil does not pull the magnet off. Currently I have turned the band upside down and inserted the processors through the hole that was the bottom for the battery. I then place the left processor back to front so it sits further away from the magnet site under his skin. The left magnet probably falls off every 10 mins at the moment and with the bonnet on his head as well it not always a quick manoeuvre to replace it. But the bonnet is still required to stop him from grabbing them and pulling them off. I have had to completely give up on him wearing them in the car as with little to keep him occupied he has plenty of time to work out how to get them off and in his mouth. They are apparently splash proof but I am not keen to allow him to work out how much sucking constitutes a splash. My friend Jane, a talented seamstress and designer, has been churning out new versions of the bonnet for Harry over the last week. Actually I discovered it is really a pilot’s cap, so sorry Emily Blunt we are streets ahead of you. For those of you who are interested in the technical details Jane has replaced the string under the neck with a strap and popper button which has stopped the chaffing from the wet ties after each meal. She has also made the caps in significantly smarter and cooler fabric choices so he can co-ordinate with his outfits. A big thanks to Jane and Miles for being the model. I have one last ditch at a solution for keeping the CI’s on and saving my sanity. 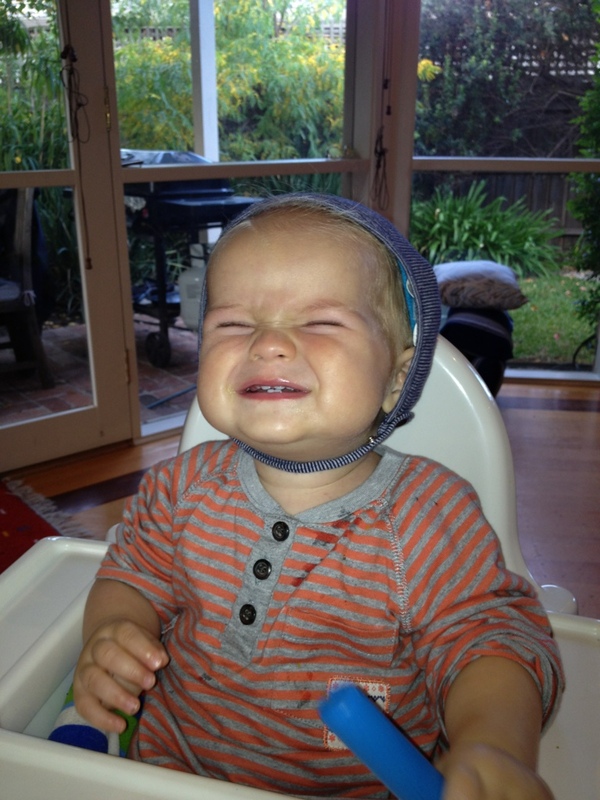 A website set up by a Sydney mum with a bilaterally profoundly deaf son Henry. 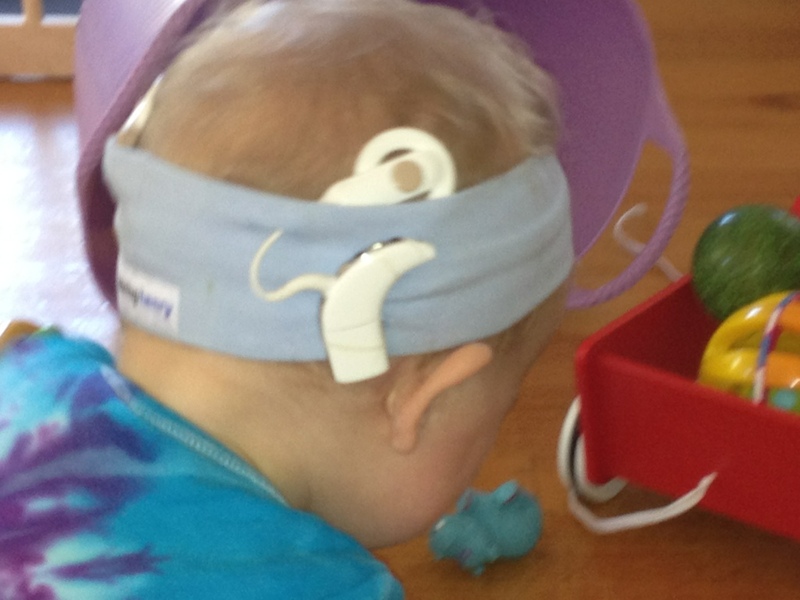 She has called her site Hearing Henry and has made some of her own headbands which allowed her son to get through the first year wearing them constantly. I was very moved reading her blog as she describes moments I have also experienced. Big thanks to Maxine in London who sent me the link to Hearing Henry and who obviously has better Internet searching skills than me.